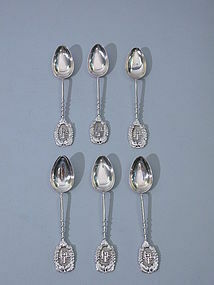 This elegant Antique set of 6 Chinese Silver Coffee Spoons was made circa 1890. 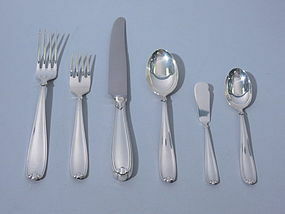 Each spoon is hallmarked “SF” for the maker, 90 for the silver standard and a Chinese character mark. The bowl of the spoon is of plain design. The stem is wrapped from the midsection to the terminal with a thick wire form piece of silver. The stem is finished with a wreath form plaque centering a Chinese character. Length: 4 5/8 Inches. Weight: 2.75 Troy Ounces. Excellent Condition.